Avid gardeners frequently celebrate the joys of the winter garden, but many folks new to gardening are less familiar with the wide array of spectacular ornamentals that show their best attributes in the cooler months. One sunny day during winter is all it takes to pique people’s interest in getting back outside and renewing their energy for their own gardens. 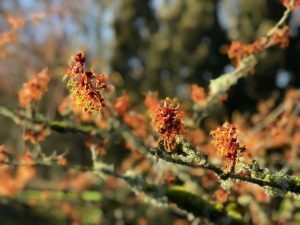 Winter is a superb time to discover new plants that might go unnoticed during warmer months, as well as seasonal qualities your favorites don’t display the rest of the year. A walk at the Oregon Garden can reveal both of these on display. In this article, we will talk about just a small sample of winter plants that are worthy of space in your home garden. They can provide a stellar focal point for those cool, clear days that invite you outside. Winter plant attributes include exfoliating bark, dramatic seed pods and winter color. Without foliage, you can truly discover the form of woody trees and shrubs. When they are unmasked from leaves, you have the practical ability to prune out dead wood and crossing branches, preserving their structure so they present even better when spring returns. However, nothing is a better reminder that spring is indeed on the horizon than winter blooming plants. Flowering trees in winter bring the significant drama to the landscape. This phenomenon, known as hysteranthous — plants flowering on bare branches before the leaves appear — is one of nature’s efficiency measures. After all, these plants bloom before many pollinators come out of dormancy. The lack of foliage is believed to assist with wind pollination, while also revealing valuable food sources to those pollinators that are present and active. 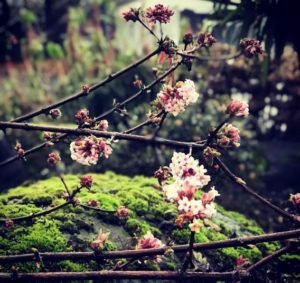 Prunus mume ‘Kanko Bai’ at The Oregon Garden in the One Green World Home Demonstration Garden. 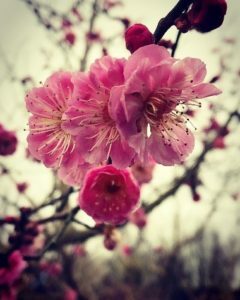 Among winter flowering trees, the flowering apricot (Prunus mume) is one of the earliest in its genus to flower. This small flowering apricot matures to just about 20 feet, is easy to maintain, has a predictable structure and is not fussy about soil conditions. It is a nonchalant garden focal point other times of year. The small, magenta semi-fragrant blossoms burst into bloom on bare branches as early as January. They last for several weeks — longer when rainy weather stays at bay. This tree certainly deserves more attention in American gardens, as it has long been a symbolic treasured plant in the East, especially in Japan. It is native to China and Korea and hardy to USDA Zone 6, so it will grow well in Northwest gardens. Cercis chinensis (redbud) trees bloom on their woody stems as winter gives way to spring in early March. You can easily identify Cercis trees even before they bloom by distinctive almost wavy branching pattern and they are distinguishable during the growing season by their medium sized heart shaped leaves. C. chinensis varieties tend to grow smaller in North America than in their native China, often maturing to 10-15 feet tall with a vase-like, multi-stemmed habit. Cercis species offer a lot of potential for the home garden and fit well into both formal and more naturalized landscape designs. 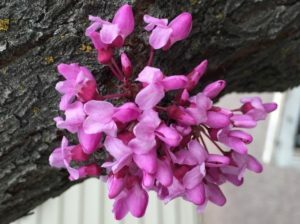 In addition to C. chinensis, C. candensis (Eastern redbud) and C. occidentalis (Western redbud) both perform well in the northwest climate. Preferring well-drained soil to clay, they need deep watering to develop their long tap root. One must avoid planting them in a soggy area and do not overwater during summer. C. chinensis is hardy to Zone 6 through 9, making it an excellent tree for the West Coast in general. Hammemelis species are truly an all-season shrub you can enjoy any month of the year but they give their most dramatic characteristics in the fall and winter. The fall color rivals almost any other shrub, including their relative Fothergilla, which in the same family is also one of the earlier spring blooming shrubs. The brightly colored spidery blooms explode all over branches. Different cultivars offer shades of red, orange and yellow, some even having two tones in one flower. Witch hazel is commonly known for the medicinal properties of the leaves and bark. Many people, by contrast, do not realize its visual appeal during the winter. 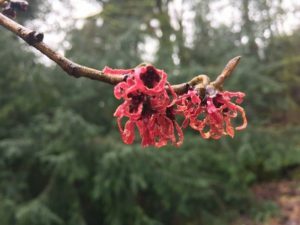 Witch hazel shrubs perform well in Northwest acidic soils, but prefer soil that has been amended to break up clay and provide better drainage. They grow as naturally spreading shrubs or small multi branched trees, maturing at about 10-15 feet tall and wide, some up to 20. They take well to pruning to create your desired aesthetic, but truth be told, they look best when provided with enough space to mature. 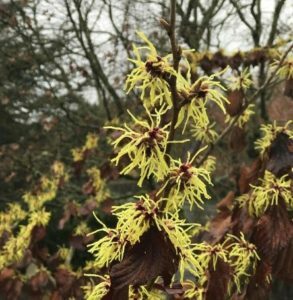 With countless hybrids on the market, witch hazels are often the first shrubs on display at garden centers. Recent trends in plant breeding have seen an emphasis to create more compact varieties so they can find a spot in smaller urban gardens. Some types are hardy to zone 3, making them great in a variety of climates. 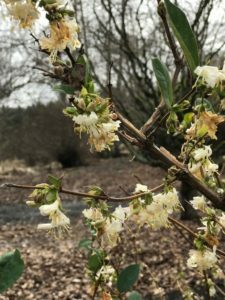 Lonicera fragrantissima, also known as winter Hhoneysuckle, is a pleasantly fragrant, winter-blooming shrub that matures to 8-10 feet with a dense, thicket-like form. It is a great plant in mixed hedgerows. The branches will hold onto the previous season’s leaves during mild winters. It’s a great pollinator attractant and will give your garden frequent visits from native hummingbirds enjoying their nectar in the creaming yellow-white flowers, so planting in view of your home is a nice winter treat. It is easy to force budded branches to bloom a few weeks early by pruning and bringing them indoors so you can appreciate the honeysuckle fragrance even sooner. Hardy to zones 4 to 8. Viburm x bodnantense ‘Dawn’ is another excellent hummingbird and pollinator attractant for winter. The clusters of pink flowers on the ends of branches are quite distinguishing. Commonly known as dawn viburnum, this is another excellent shrub for cut branches to provide winter fragrance in floral arrangements. Dawn viburnum will continue to bloom even in part shade. It is drought tolerant once established. Fall color is also evident, a characteristic of the Viburnum genus. Pruning encourages new buds as they are born on new wood. Hardy to zones 5 to 9. Getting there: The Oregon Garden is open 365 days a year. The Visitor Center and Gift Shop are open Friday, Saturday and Sunday, 10am to 4pm. You can purchase Garden admission or become a member other days of the week at the Oregon Garden Resort front desk from dawn until dusk, simply drive past the Visitor’s Center to the Resort Lobby to access the Garden. Allison "Ali" Pennell is the current Development Director for the Oregon Garden Foundation. She has worked in many facets of the nursery industry from propagation to landscape design. Her passion is sharing the intrinsic value of horticulture with the public as well as maintaining her lifelong "Certified Plant Nerd" status.